"At some point even the really smart people, the doctors, the lawyers – they start getting replaced by machines, automation and then transhumanism becomes I think a full revolution, where it's really technology versus humanity." 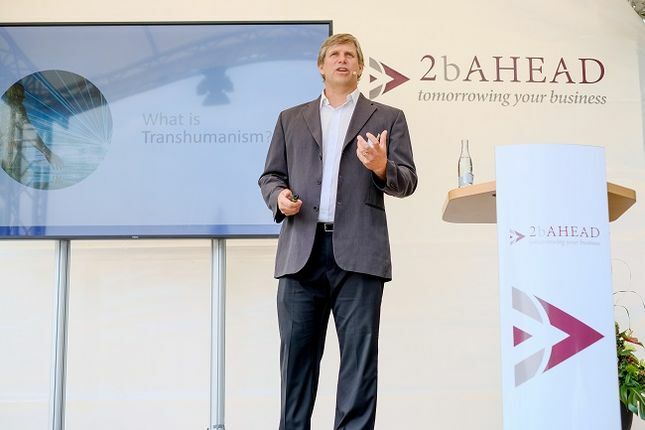 Zoltan Istvan, former National Geographic Journalist, founder of the US Transhumanist Party, author of the bestselling novel "The Transhumanist Wager" and keynote speaker at the 17th 2b AHEAD Future Congress believes that we will have to merge with machines so that we don't ultimately become dominated by artificial intelligence. After his speech, we had the opportunity to ask him some in-depth questions about his views. How can we use progress to our advantage and overcome the limitations of the human body, and what will it mean if we choose not to do so? 2b AHEAD: We've had a long-term study, "The future of your children," where we look 100 years into the future – and one of the theses that we engage with is the view, that it's possible through technologies, technology a whole to enable – theoretically at least – immortality. And you've mentioned this is something, that you think is a core goal, a core achievement of transhumanism – what do you see the technology is taking us forward here or how do you see this journey from here to a tech-based immortality? Text and audio for the full interview is available here.